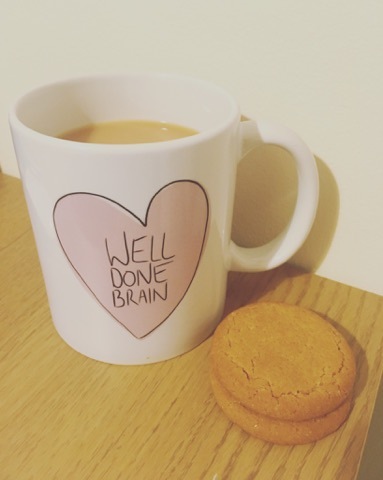 Boring Self Care Nov: A project by Hannah Daisy, an occupational therapist based in the UK. I’m two days late to this but I was reminded about it when I scrolled onto one of her drawings on Instagram again and also because as I write this (and for the past couple of days) there’s clean laundry piles dotted about the whole house. I’m good at the cleaning part because it’s easy for me to pick up a pile of dirty clothes and put them in the washing machine. I never used to be good at the drying part because of memory problems but we now have a washing machine that beeps when it’s finished and doesn’t stop beeping until you turn it off… Very annoying at first but actually very helpful now. The main problem when it comes to folding and putting the laundry away is my chronic fatigue (a very common symptom after a brain injury), I’ll fold the clothes but be too tired to put them away. They’re clean though so it’s ok? I know it isn’t but I like to think that when I get sad. I get sad because it’s supposed to be such a simple task, but unfortunately living with a brain injury the simplest tasks often become the most complicated things you’ve ever done. Sometimes I’ll need help but that help will only be Stephen putting the laundry in the washing machine and taking it out. Even if I’m tired I like to hang things myself because I’m very particular. I’ll try to do laundry every day and I think I’m good at sticking to that because I notice when the basket is getting too full and as I’m in the habit of doing laundry I’ll also notice when I haven’t done it for a few days. Stephen and I moved into a rented house at the end of August which graced us with the beeping washing machine. However, the kitchen doesn’t have space for a tumble dryer and we only set the tumble dryer up in the garage two weeks ago, before that doing laundry took so much longer. Doing laundry must be faster now right? Well, no. Due to memory problems I forget if I actually turned it on, I forget whether or not there’s laundry in there to go and collect and I often leave the light on. Meaning I’ll go to the garage up to three times to check all of these things. Meaning doing laundry hasn’t really sped up. The garage isn’t attached to the house either, another small thing that becomes a big thing when you live with a brain injury. Despite all of these things I still manage to not get overwhelmed with dirty laundry, I’ll try and sort all of the piles at once because they can get a little overwhelming. At the moment though, because I’m so busy with my blog (which is also very tiring) I haven’t sorted any for days. There’s currently six piles on the go. Overall, I like doing laundry. (I know how sad that sounds) I like not having to stress and do lots of laundry at once because the basket is too full, I enjoy the way the house smells in autumn/winter when the clothes are drying on the radiators and I like being able to wear something without worrying whether or not things are clean. 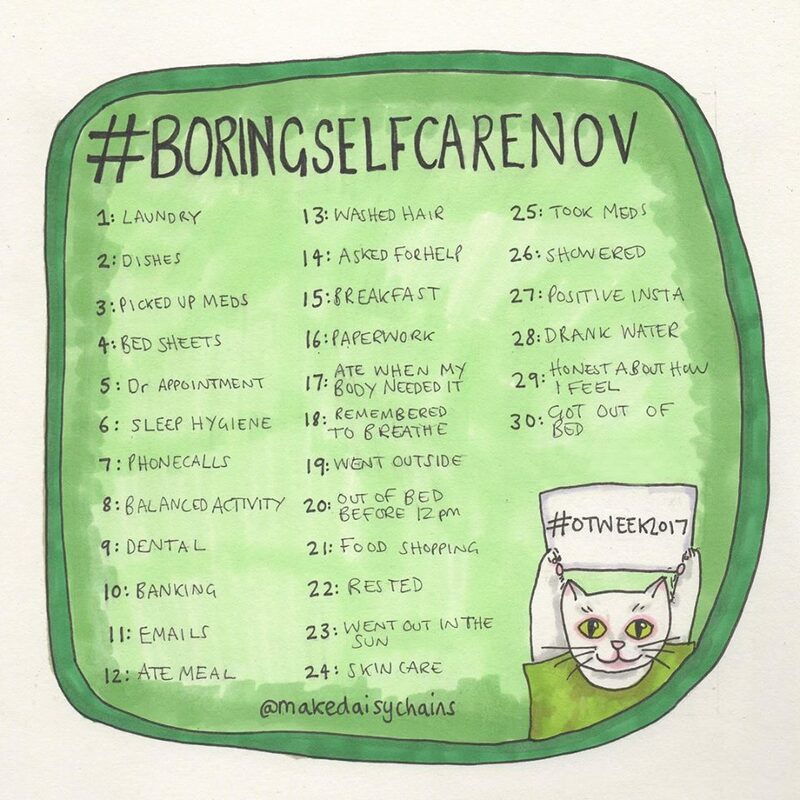 Are you taking part in the Boring Self Care? You can read more about it here. How is doing laundry for you?